Baldwin High students in the school's one-act play production of "Fame" probably found it pretty simple to sympathize with the plights of their characters. The show took home second place at last week's region competition, and the students will have put on a few showings for the home crowd at the school's Fine Arts Center tonight, Nov. 3 and Nov. 4 all at 7 p.m.
"Fame, set in the early 1980s at a high school for the performing arts in New York City, tells the stories of its students as they try to survive four years of high school," said BHS Theatre Director Anna Brock. "Students deal with your traditional high school gripes — dealing with hard teachers, developing new crushes, and making new friends — all with the extra pressure that comes with wanting to make it big in music, theatre or dance." The production features 22 students in the cast as well as 15 working backstage, and Brock said they have all been hard at work since the beginning of the school year. "We had auditions as soon as school started and have been working four to five days a week since the beginning of August. We've had the pleasure of working with new music director Brad Bell from Blandy Hills Elementary who has been a perfect addition to our theatre program." The show may not have come out on top of the region competition, but the cast and crew received plenty of recognition from the judges for their outstanding performance. Landon Bell won best actor, Addison Bell won best supporting actor, Olivia Pelton won best supporting actress, and the cast took home best ensemble in the region. The show received a rating of "superior" from all the judges. Brock said that her choice of production was by no accident. "I chose 'Fame, Jr' as our fall one-act because the basis of the show — super-talented students pursuing their dreams — mirrors our fine arts program at Baldwin High School," said the theatre director. "We have some insanely talented students at our school, and I felt we needed to do a show that allowed them to showcase those talents." Doors open at 6:30 p.m. for each of the showings at the BHS Fine Arts Center and tickets can be purchased for $7. Brock added that because the show features a character facing a drug problem that performances are intended for audiences 13 years of age and older. 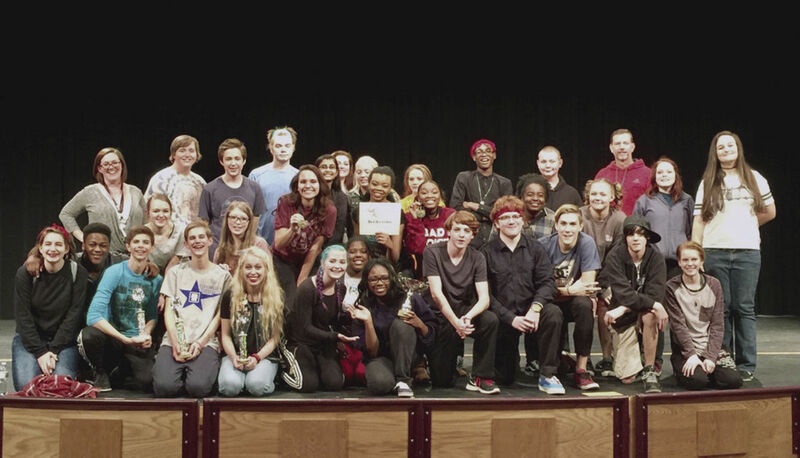 "We could not be more proud of our students for their performance at region one-act competition," Brock said.